Thanks, UofR Students! – Welcome to Swillburg! Let’s hear it for our University of Rochester student volunteers! 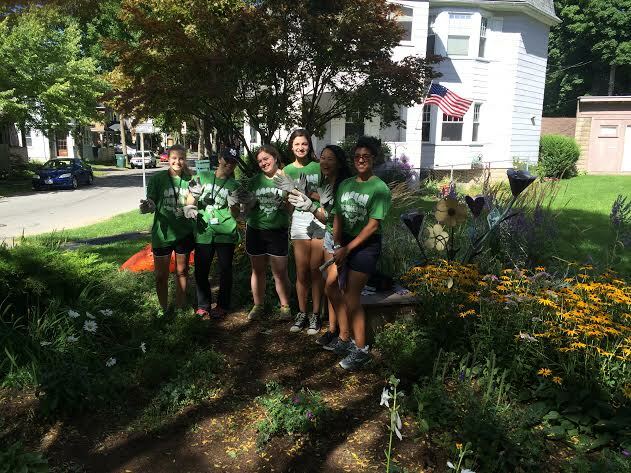 12 great incoming freshman participated in Wilson Day 2014, a day of service 26 years strong throughout the greater Rochester area. Our volunteers got a great history lesson about the founding and subsequent preservation of our neighborhood from our resident historian before heading up to South Clinton Avenue to beautify the Charette Garden and our main commercial thoroughfare. Here’s a picture of a few of our volunteers, taking a break and catching some shade in a Swillburg garden. Thanks again – we had so much fun getting to know you and wish you the best of luck on this exciting new chapter of your lives!